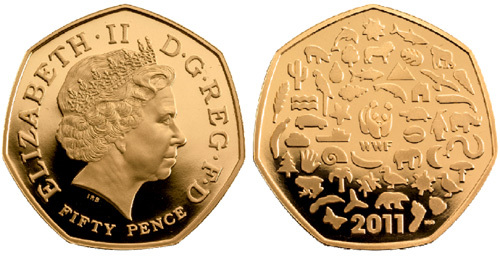 50 years of the World Wildlife Fund (WWF), 50 different animals and plants representing the many environmental and conservation works overseen by the WWF, on a 50 pence coin. This is the latest issue from the Royal British Mint, which marks the 50th anniversary of the founding of the World Wildlife Fund. Centered around the charity’s iconic panda logo at the heart of the design, is a dolphin, gorilla, rhino, polar bear and butterfly. Other symbols featured on the coin include a car, a wind turbine, coffee bean, and a human footprint to represent man’s impact in the world. The coin’s year of issue, “2011” is placed below the collage of figures. The obverse carries the familiar Ian Rank-Broadley portrait of HM Queen Elizabeth II along with the coin’s denomination of fifty pence. This commemorative coin is struck in both sterling silver and 22 carat gold to proof quality. The silver edition has a weight of 8 grams and a diameter of 27.3 mm. The gold edition has a weight of 15.5 grams also with a diameter of 27.3 mm. Established in 1961, the World Wildlife Fund was founded by a group of wildlife experts including Sir Peter Scott, who joined forces to combat environmental problems across the world. Fifty years later, WWF is tackling much more than just the conservation of endangered species and their habitats.